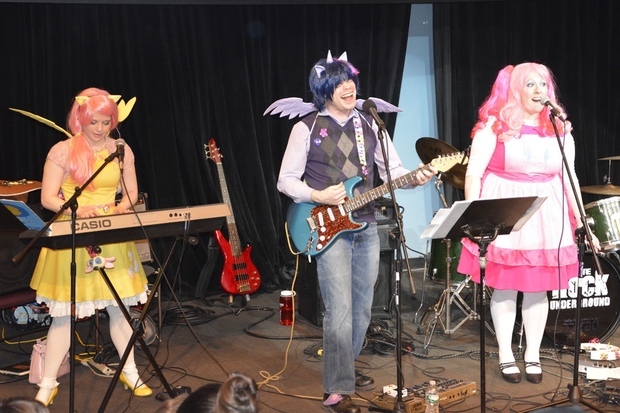 The Shake-ups in Ponyville, a band that plays music inspired by My Little Pony, will be among the performers at Ponycon 2016, the convention for "bronies" and other fans of My Little Pony. PARK SLOPE — It's a dream come true for Brooklyn bronies. Grand Prospect Hall, the chandelier-laden reception hall that promises to "make your dreams come true," will host a three-day convention for My Little Pony fans next month. The stampede of attendees will include "bronies" — young male fans of the animated TV series "My Little Pony: Friendship is Magic" — but the gathering is a family-friendly event suitable for all ages, Ponycon operations director Bill Crumlic said. Last year, Ponycon organizers expected between 1,000 and 1,200 pony lovers, but 1,700 showed up. At its new stamping ground at Grand Prospect Hall, Ponycon 2016 could be the biggest ever, with room for more than 3,000 fans. Though the classic definition of a brony is a "nerdy" guy who likes "My Little Pony: Friendship is Magic," Crumlic said, bronies are more diverse than one might assume. The herd has expanded to include female bronies, jock bronies, and even military bronies with a fan group called FOB Equestria, Crumlic said. Younger fans will have a variety of special activities to choose from, Crumlic said. Kids can even get multi-colored hair extensions (manes) at a spa and there will be costume contests, sing-alongs, the kid-friendly band The Shake-Ups in Ponyville, and story time with an author who's written for the TV series. "We found last year that by inviting families, we ended up making a really neat family experience,” Crumlic said. "We were like 'Wow, that's right, this show was actually made for little girls, we should probably do something for them.'... We've been able to make it a well-rounded convention that serves families, bronies and also toy collectors." PonyCon 2016 will be held Feb. 13-15 at Grand Prospect Hall, 264 Prospect Ave., Brooklyn. For a complete listing of event and more information, click here.